There's a certain way I sew together the cast-on edge of feet, arms, and the back of heads that gives them a nice rounded shape, rather than having a straight seam. I thought I would share that technique, and I've taken a bunch of photos to help illustrate. They're a little out of focus, because there isn't a lot of light and I had to hold the camera rather than use a tripod. Hopefully you can make out what I'm doing, and try it yourself. A leg, ready to be sewn. I use a long tail cast-on, which leaves nice loops along the edge. Other kinds of cast-on will look different, but should still work. 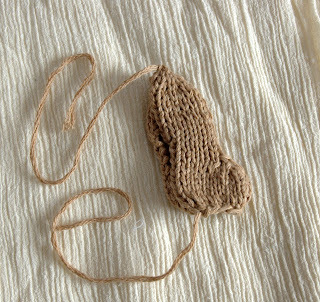 Thread the needle through the loops of the cast-on edge, starting from the side opposite to where your yarn end is attached to the leg. 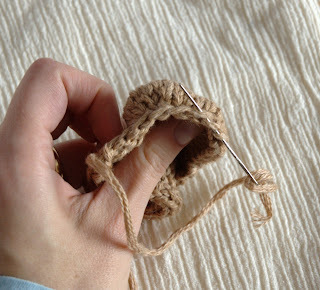 The needle has been threaded through all the loops of the cast-on edge. 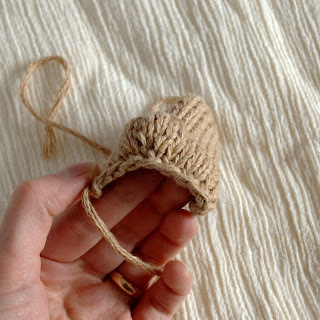 Pull the yarn through the loops, and pull tight until the bottom of the foot is gathered together. There! Now you have a nice, round bottom to the foot. 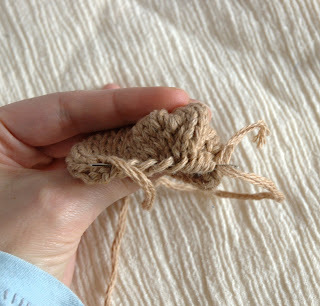 You can continue sewing up the back seam of the leg with the yarn. Posted by Barbara Prime at 5:01 p.m.
That's terrific! Thank you for sharing - I'll try it when I make the monkey (he's next on my list). March 20, 2008 at 6:32 p.m.
March 21, 2008 at 11:15 a.m.
March 21, 2008 at 2:48 p.m.
great to get to see what you do to make your toys so gorgeous. March 21, 2008 at 7:10 p.m.
March 26, 2008 at 5:06 p.m. 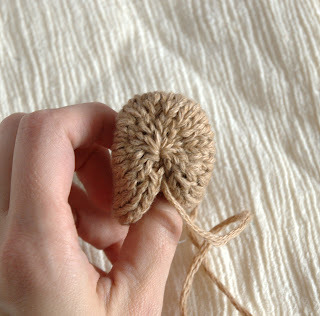 I realize that this hint was originally posted two years ago, but I just started my first pattern of yours so I am finding it very helpful RIGHT NOW. Thank you so much for having such great information on your website and in your patterns. August 15, 2010 at 10:24 p.m.